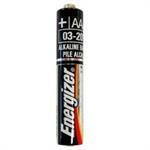 ALKALINE BATTERIES - AA, AAA, C, D, N, AAAA, Button cells, BULK PACKS. Factory Fresh & ready to use. The LR44 is a 1.5 volt alkaline button battery. Size is 11.2mm dia x 5.2mm tall. X-ref part #s are CR44, SR44, 357, SR44W, AG13, G13, A76, A-76, PX76, 675, 1166a, LR44H, V13GA, GP76A, L1154, RW82B, EPX76, SR44SW, 303, SR44, S303, S357, SP303, SR44SW. Duracell D alkaline cells - $2.50 each. Choose any quantity to suit your requirement. Duracell Alkaline "D" cells - pkg of 4 cells, factory fresh & ready to use. 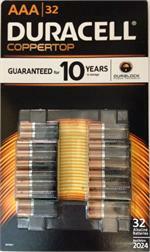 Duracell "D" cells - 4 pcs Alkaline battery cells, factory fresh & ready to use. X-ref part #s MN1300, LR20. These Duracell-brand D-size batteries are 1.5 volts DC per cell. Duracell 9 volt Alkaline batteries - package of 8 cells. Duralock power preserve design. Guaranteed for 5 years in storage. Good thru 2019. Bulk pack of Duracell AAA batteries. Qty = 32 cells. Factory fresh. Duracell AA bulk pack - 40 Alkaline cells, factory fresh & ready to use. DURACELL AA Alkaline batteries - bulk pack of 40 cells, factory fresh, factory sealed. 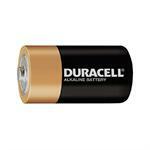 4LR44 : 6 volt alkaline battery - GP brand. Replaces 476A, PX28A, A544, V4034PX, etc. 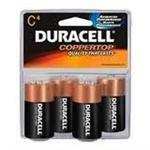 Duracell Alkaline "C" cells - pkg of 4 cells, factory fresh & ready to use. 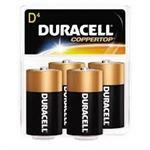 Duracell "C" cells - 4 pcs Alkaline battery cells, factory fresh & ready to use. X-ref part #s MN1400, LR14. These Duracell-brand batteries are 1.5 volts DC per cell. 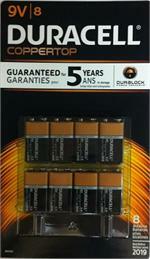 Duracell Alkaline 9-volt - pkg of 4 batteries, factory fresh & ready to use. Duracell 9-volt Alkalines - 4 batteries in pkg, factory fresh & ready to use. X-ref part #s MN1604, 6LR61. These Duracell-brand Alkaline batteries have a nominal rating of 9 volts DC each. Duracell AAA alkaline batteries - pack of 14 cells, factory fresh. Duracell AA bulk pack - 20 Alkaline cells, factory fresh & ready to use. Duracell AA bulk pack - 20 Alkaline cells, factory fresh & ready to use. X-ref part #s MN1500, LR6. These Duracell-brand AA alkaline batteries are 1.5 volts DC per cell. Duracell AAA bulk pack - 20 Alkaline cells, factory fresh & ready to use. Duracell AAA bulk pack - 20 Alkaline cells, factory fresh & ready to use. X-ref part # LR03, MN2400. These Duracell-brand AAA size batteries are 1.5 volts DC per cell. Duracell C Alkaline batteries - 12 pack.